Watch our Saturday Smoke @ Commonfolk - Not so 4th of July' Whole Pig party. And get in touch at www.redgumbbq.com.au to find out when the next event is! Once upon a time there was a girl from the South and her man from across the pond who had a dream of bringing BBQ to the masses. But more than just BBQ, we imagined the whole, real deal. The kind of venue, food, music, drink and people that created that special something. A place where people felt they were with family - where the meat, music and merriment was in plentitude - and where people left with full bellies and smiles on their faces. This was the dream that became Saturday Smoke. Sometime in 2013 we visited Commonfolk Coffee and were excited to find a place that we felt was really doing things right - or at least right in our very not-expert opinion. The space, the food, the feeling that you got when you walked in the door - like you could kick up your heels and make yourself at home. And let your kid eat off the floor - bonus. When we thought about where we would like to do a pop-up on the Peninsula - this venue was top on our list. Sam - the mastermind behind Commonfolk was so generous of his time, his advice and his space. After much consideration for how the event would come to life; Saturday Smoke was born in May of 2014. A night of Meat, Music and Merriment - where a 3-course family style dinner was presented amongst the wide open space, long bench tables and open air outside of the venue. We fed and fed - until people could be fed no more. 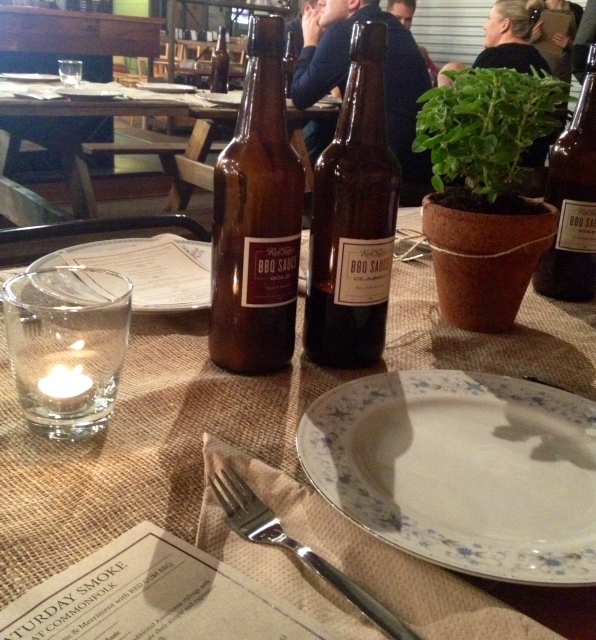 We adorned tables with hessian runners and herb plants. Sourced local craft beers, wines and ciders and connected with our Peninsula roots. We got some of the best bluegrass and folk singers around to come add their strings, voices and soul to the night and by the end of the evening we knew we had made our little BBQ dream come true. What began as an unsure organiser, a hesitant but hopeful Pitmaster and Chef, a new and inexperienced staff and a room full of curious strangers - ended with a community of friends, of glowing compliments and of a thrilled and tired Mr. and Mrs. Pitmaster. This first Saturday Smoke turned into a monthly event - where we trialled a continuous stream of Southern cooking to overwhelmingly kind praise. But more importantly, what never faltered but in fact grew, was the sense of family and community we found in the event. We believe that BBQ brings people together and is best amongst friends and Saturday Smoke was the testament to this. This BBQ dream realised, we're onto the next! Saturday Smoke will live again. Watch this space. And stay tuned to see more of our dreams come true.